Hello, I have an 03 Hyundai Tiburon. Great car. But I locked the car with keyless entry system. I go to use the keyless to go to lunch, and it seems not to respond. The car will not unlock with the keyless, So I use the regular key and set off the alarm. However, the car won't start even when i put the key in the ignition. I beleive it may be a security feature. So I bought a new battery at radioshack for the keyless. The employee doesn't know how to replace the battery. I opened it up. THe battery seems to be held in place by three prongs, but they won't budge, and the battery won't come out. Does anyone know how to replace battery? Am I going about this problem the correct way? 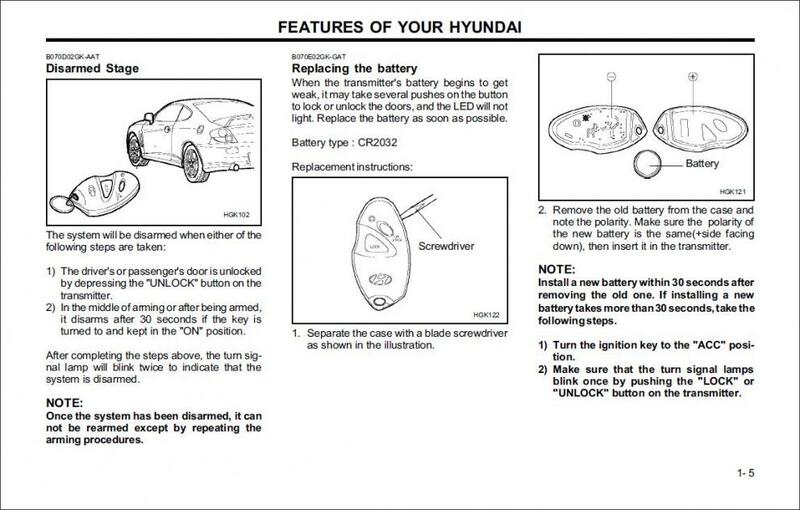 Solution to first problem: Unlock the door with the key, open the door (alarm will sound), get in and turn the key to the ON position but do not start the car. Wait until the alarm stops (that may be a minute or two). When the alarm stops, try to start the car. This "USUALLY" works. Solution to second problem: You need to pry the battery out without damaging the prongs. It usually just slides out. Keyless entry works passenger door but not driver's? Hi...just purchased a used 2010 Veracruz...any help appreciated....our keyless remotes only open passenger door and trunk....not driver's side....any ideas? There there is a problem with the actuator in the drivers door.